Don’t let a physical limitation stop you from reading! Audio books and magazines can be loaned free to any Idaho resident who is unable to read standard print, hold a book, or turn pages due to a temporary or permanent physical limitation. Register to share information about TBS with your staff, community members, and policymakers and receive free promotional materials and access to social media tools. Learn to use the TBS Catalog. This Online Public Access Catalog (OPAC) allows users to order books from the Idaho Talking Book Service directly from their computers and download digital titles from BARD or the Shelf Project. 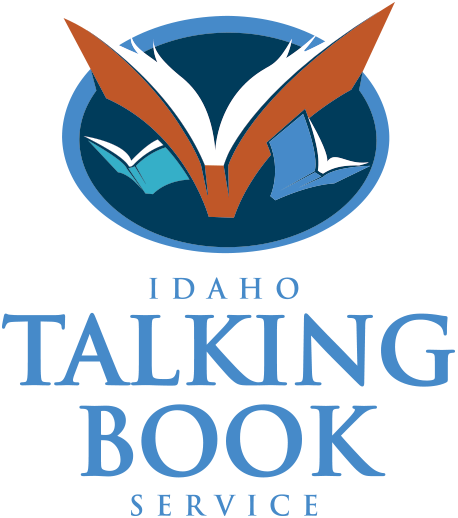 Anyone may search the catalog, but only those eligible to use the Idaho Talking Book Service can order from it. Additional information and search tips. A list of digital titles currently available for download. Users must be registered to use the Talking Book Service and must register to use BARD. How do I sign up to download from BARD? If you haven’t done so, first submit an Application.. Once approved, you can Register to use BARD. Here are additional Registration and Download Instructions. The Talking Book Service has more than 85,000 audio books and 70 magazine titles from which to choose. The collection contains fiction and non-fiction topics ranging from astronomy to westerns. Reading levels range from very easy to adult. Books are available in many languages in addition to English. Plus, users can receive books and magazines in Braille, enjoy books about Idaho’s history and lifestyle, and listen to more than 200 daily newspapers! Registered users can request books via the online library catalog, by supplying their reading interests and having books automatically selected from those topics, by downloading from an online database, or by scanning paper or audio catalogs for recently recorded books. The Talking Book Service records audio books and magazines about Idaho and the Pacific Northwest and currently has more than 800 books and several magazines available. Contact the Talking Book Service to receive a login and password to download via the Shelf Project database. Download from these online databases and never have to wait for a title again! Requires a computer, high speed Internet access, and ability to manipulate files. More than 65,000 audio magazine and book titles professionally recorded by the National Library Service. Shelf Project: Hundreds of books about Idaho and the Pacific Northwest history, geography, and other topics recorded by volunteers at the Talking Book Service. Contact the Talking Book Service to sign up. Braille readers receive paper Braille books and magazines from Utah via the USPS. Contact the Talking Book Service at 800.458.3271 to register for this free service. Audio, Braille, and print/braille books in the NLS collection for preschool through grade 8. Listen to more than 300 daily newspapers from across the U.S., including 3 titles with Idaho news: The Idaho Statesman (southwest Idaho), Post Register (eastern Idaho), and The Spokesman-Review (northern Idaho) Users also can listen to magazines, local TV listings, job listings and more! Contact the Talking Book Service for more information or to receive your password to use Newsline free of charge. Keep current on the latest news with the quarterly newsletter. Receive in large print, audio format, via email or the Shelf Project. Listen to the newsletter podcast. Enjoy audio, braille, and large-print music scores, texts, and other instructonal music materials. Listen to an overview of the free service. Access to these fee-based resources is not part of the Talking Book Service, but these resources provide additional sources and types of reading materials. Titles from these resources will play on the Talking Book Digital player with a free User Authorization Key (UAK) provided by the vendor. Bookshare: More than 150,000 digital books, textbooks, newspapers and magazines available for download and accessiblein multiple formats. No access fees for students of all ages. Learning Ally: 75,000 audio textbooks and literature titles downloadable and accessible on mainstream as well as specialized assistive technology devices. Louis Catalog: Maintained by the American Printing House for the Blind (APH), the Louis Database of Accessible Materials contains information on accessible print materials produced by about 160 organizations throughout the United States. Materials are available in braille, large print, audio, and electronic file format. To purchase materials developed by APH, visit ShopAPH. Louis Plus: This database locates accessible instructional materials in Louis, the National Instructional Materials Acess Center, and Bookshare. Be certified by a medical doctor as having a reading disability due to an organic dysfunction that is severe enough to prevent reading in the usual manner. The disability may be permanent or temporary. I am very impressed with the TBS service and especially for the help I have been given finding books to read while I was hospitalized. I am thoroughly enjoying every one of my books and really love this service! Many thanks to the ICfL for offering this meaningful service. The staff was helpful when there were questions and delivery was always timely and convenient; the title lists were long and varied-there is definitely something for every listener’s interest. The titles were a major and almost sole source of entertainment and learning for my mother as her eyesight failed. Thank you for the beautiful calendar, and all the special things you do for us. I love the Talking Book Service and the great people organizing it. This note is written on behalf of my grandmother who is 95 years old this month and has macular degeneration. She so much appreciates your service. Every time she gets her books on tape to listen to, she just lights up. Thank you for everything and having such a great service for those who cannot see. Thank you for making her smile. Thank you everyone who participated in providing mother with such a wonderful service. She would sit by the hour and listen to her books and laugh and cry and loved every one! Much thanks from the heart of a grateful daughter! Your service brought light to her darkened world! Up until his passing our father enjoyed hundreds of hours listening to books. Thank you for this great service. My mom was so appreciative of the service you offered, and it had such an impact on the quality of her life as a legally blind person. She was always an avid reader before her sight declined, so she was so thankful for the talking-book program which enabled her to listen to books. We want to thank you so much for the books you are providing for us. They bring hours of enjoyment to my dad. Be assured that your service provided tremendous comfort and entertainment to my father for several years. He was thankful, and so are we, his family, for your support. My mother passed away on November 2nd. Mom greatly enjoyed the ability to read books and to feel a part of the “normal” world of a seeing individual. Thank you for the invaluable service you provided and to others who are vision impaired. THANK YOU to all who have any part in sending out the books! I so appreciate listening to your books to fill up my long days and long nights! I use your service for many of my clients, especially those with depression and dementia. Your service has saved lives! I am so appreciative of this service and I pray you will be blessed full circle for the good you do to bless many lives. The last 3 years of my wife’s life, the Talking books were her life. She listened to about 3,079 books while on the program! We cannot thank all of you enough for your wonderful service over the years. It has been outstanding. Your selection of books has been excellent. There are no words to express how grateful we are and tell you how much you are appreciated. In the past few months you have sent me Guidelines and Welcoming information in regard to the Talking Book Service and I wanted to express my gratitude for this service and the work of your staff. It has been 28 years since an accident removed much of my sight for reading and nerve and memory problems from an old accident. But I have always been a reader and still love the ideas of authors in spite of my problems seeing. Talking books has allowed me to read books that I’ve missed for these past decades. TBS has improved the quality of life for my 88 year old mother. She never stops talking about the recent books she’s listened to and I can’t thank you enough for this service! Thank you for the wonderful service, in particular the indefinite checkout of her Bible. Thank you so much; I enjoy these books. When I found out I was going blind I thought my life was over. With all the things available it isn’t so bad. I’m not sure which person to thank for all the kindness and help you have been to me!! I certainly appreciate all of you there. Such a blessing for me and others. Thank you for keeping me entertained and educated. The Talking Book Service enriched my father’s life from his late 80s to the time of his death at age 96. My dad was legally blind with dry macular degeneration during that time. He mostly wanted to listen to non-fiction books, history and biographies, but we would occasionally surprise him with a book of fiction. With little sight to watch television, talking books was his gateway into a lifelong interest in the world and news around him. I can’t imagine how empty his life would have been without the Talking Book Service. 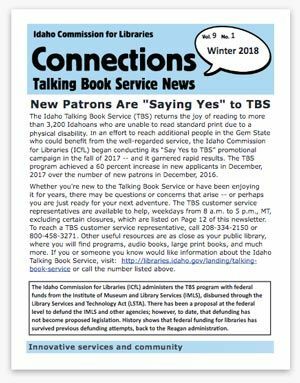 Connections: TBS News is a quarterly newsletter of the Idaho Commission for Libraries’ Talking Book Service. Read the latest issue of Connections.